It was such a remarkable moment as the region of Tooro – one of the famous Uganda Safari tour hot spots takes on the challenge of selecting the Miss Tourism. In the lush environs of Mountains of the Moon Hotel, the night of Friday July 22nd was a romantic and yet a tense one as the auditions for Miss Tourism went on. Positioned at a vantage point overlooking the Royal Karuzika palace, the Mountains of the Moon Hotel is one of the popular hotels used by travelers on safaris and tours in Uganda and thus had a credible ground to host a significant audition. The contest which had a count of five (5) people in competition saw Grace Nyakaana emerging as the winner by Midnight. Grace is noted to have become the third ambassador for tourism ever since the preliminary arrangements commenced at regional level three years past. From most of the revelers, it was clear that Grace had locked from the start. The confidence, poise, expert knowledge about the culture of Tooro and the tourism industry in general put her cut above the rest. Grace also took the Miss Social Media and Photogenic category awards. 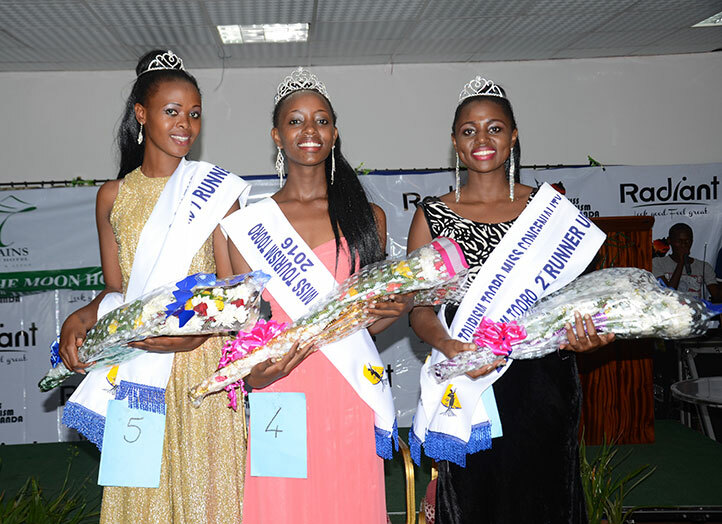 The second runner up was Christine Kajumba while the third runner up was Gorret Peace Kobusingye. These three (3) beauty angels will go to the boot camp to join the national competition with those from other regions including Rwenzori, West Nile and Karamoja. During the event, Shamim Kabahenda was the crowd’s favourite and was crowned Miss Talent while Kobusingye took the Miss Culture category. The guests who included those on Uganda tours were entertained by the local Musician Kigambo Araali. The event was attended by a range of people including the Minister for Tourism in the Kingdom of Tooro Anna Bagaya who disclosed the Kingdom’s commitment to unleashing the region’s tourism potential especially under the New Campaign named Tooro Kokasemera. Tooro region features a range of attractions including Kibale National Park, Semliki National Park, the Fort Portal crater lake field, Ndali Kasenda crater field, the Royal Kingdom of Tooro and its heritage, tea estates and Amabere g’Nyinanmwiru caves which combine to make it a rich destination worth inclusion on the itinerary as one plans a safari to Uganda.